Molly’s dryer balls are sustainable, compostable, antimicrobial, and made purely of 100% wool to the core. 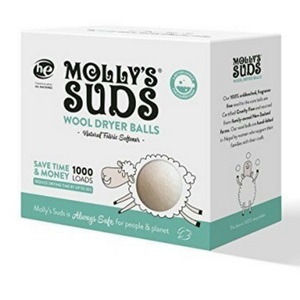 Molly’s Suds 100% Wool Dryer Balls LAST A LONG TIME – on average 1,000 loads or 3 years in the dryer! They can reduce drying time by 15-30%. They Fluff up towels, comforters and all other types of laundry. They help reduce wrinkles. They are great for sensitive skin as they are unscented and free of PVC unlike plastic dryer balls.